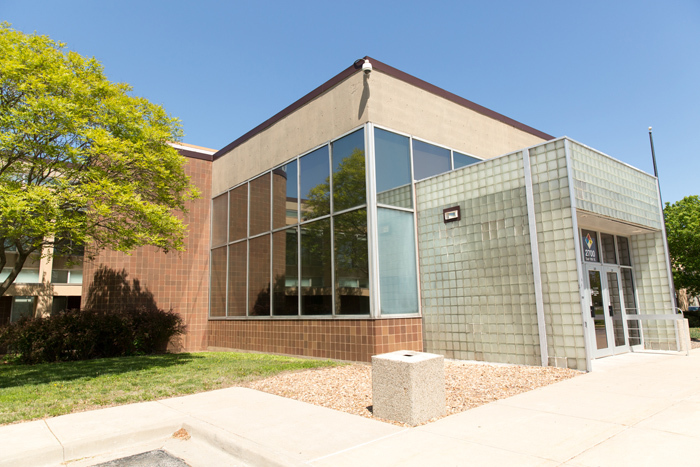 The building at 18th and Prospect has been the home of Health Forward since the foundation's inception. The entry hallway into the Foundation. 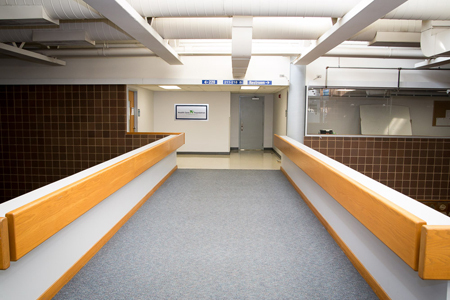 Many are familiar with this door as the welcome desk and reception of Health Forward. But this was also our original small office space. 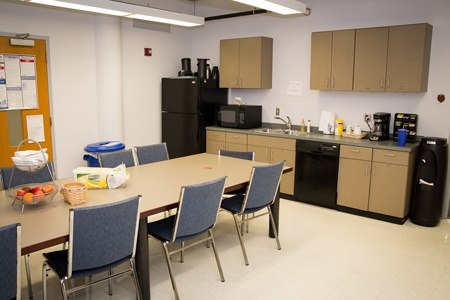 Our break room, the site of so many happy lunches. 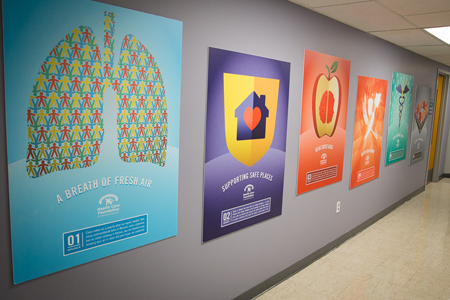 In 2015, we celebrated our 10 year anniversary and the hallways got a facelift as well, displaying the 10 areas of health that improved over that tenure. The Jonas Board Room, also the location for many fun staff meetings. 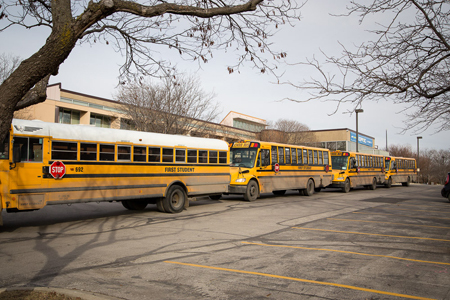 Each school day, buses line up in front of the entrance to pick up and drop off students. 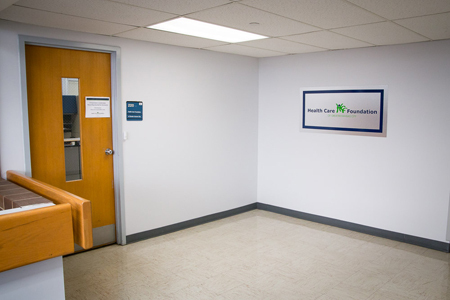 At the corner of 18th and Prospect sits a humble, unassuming building that has been the home of the Health Forward Foundation since our inception 14 years ago. 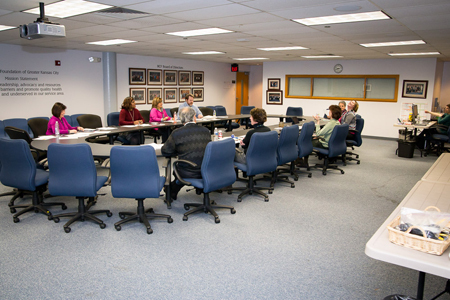 In those early days, the inaugural Health Forward Board of Directors looked for a location that could provide a short-term lease while the board met and began to hire staff. They chose the Pioneer Campus of the Penn Valley Community College located at 2700 E. 18th Street as the Foundation’s first official home. 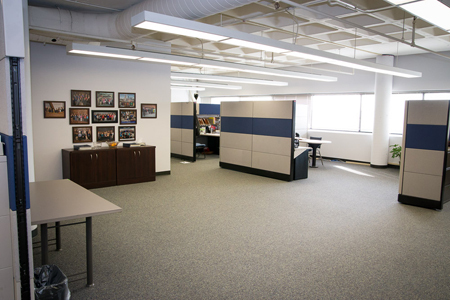 Over time, as our team expanded, so too, did our office space. 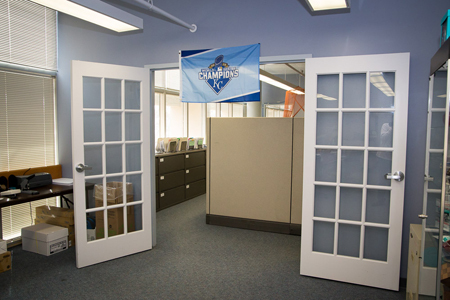 What started as a small room up front — what visitors now recognize as our welcome desk — spread down and around the hall to accommodate our growing team. The small, temporary office had turned into our home. We were not the only ones that changed in that building though. Our neighbors changed as well. The building transitioned from a college campus of Penn Valley to what is now the KIPP: Endeavor School. The school grew like the foundation has over the years. After purchasing the building last year, KIPP expanded to the second floor. 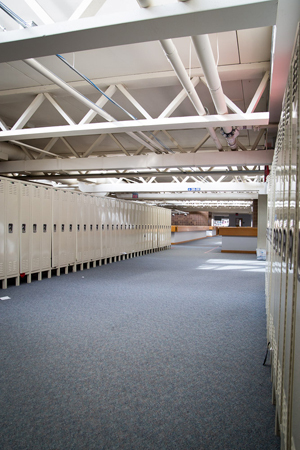 Buses overtook visitor and staff parking spots, lockers lined our hallways and band music accompanied our meetings. Many of our visitors are surprised to see a foundation cohabiting with a K-8th grade school. To be frank, sharing our space with 5–14-year-olds has definitely presented some challenges to our work environment. But as we embark on our final week at 18th and Prospect, we recall fondly our time in our first home. We’ll miss many things but especially seeing these beautiful children and their happy, smiling faces every day. Many of these children face the very barriers to health that our foundation was established to address, offering us a daily reminder of who we are working for. We are impressed by their enthusiasm and work ethic. We hear their music. We read their poetry that adorns the walls. We’ve enjoyed their artwork; it has made our walk to our office brighter. Our founding board aspired to find a home that reflected who we were. After 14 years here at 18th and Prospect, we can say to them, job well done. But times and circumstances change. 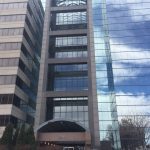 As of Friday, Health Forward will relocate to an interim office building at 2300 Main Street as we continue our search for the next permanent home for the Foundation. 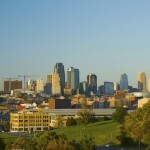 Health Forward is excited for a change in scenery. This building has served us well. We pass it on with good memories and good karma to the generations to follow. View more pictures on Facebook.